Please join us for the Choose Civility Washington County 2018 relaunch: The Longest Table! We intend to make the notes from responses of approximately 150 guests (high school age and up) available on this website, the library website, and our partners' sites.. These conversations will hopefully fuel initiatives within community organizations and help determine strategic plans to better help the people of Hagerstown. It is also our hope that, for the attendees, this program will ignite a desire to think positively, engage civilly, and work conscientiously to create positive change within the community. A few friendships might even be made along the way! The Longest Table has been very successful in the cities like Dayton, OH, Tallahassee, FL, and Columbia, MD. We hope that with the help of partners, sponsors, and other community organizations, the Longest Table can become an annual event! The conversation starts when we come to the table! If you'd like to become a sponsor for this event, please download and complete this form. 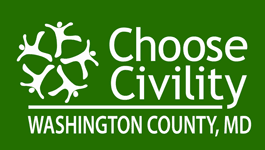 For more information about the Choose Civility Washington County relaunch, visit our Become Involved page. Choose Civility Washington County would like to thank Kyle Handy (Navy Recruiter, Fredeick Recruiting Office) and Hannah Bradley (USMH Student Council member) for helping to host the Choose Civility table at the Hagerstown Suns August 25, 2013 Red Out Sunday ballgame. The Suns generously donated a team autographed batting helmut as a raffle prize for this game. Pictured below is Washington County Free Library Assistant Director Kathleen O'Connell with Hannah and Kyle, holding the prize batting helmut. 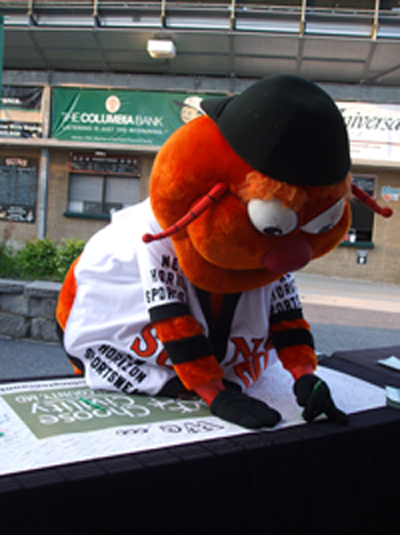 Washington County Free Library hosted the Choose Civility table at the July 28 Hagerstown Suns Game. Congrats to the Suns on their 5-1 win over the Delmarva Shorebirds. 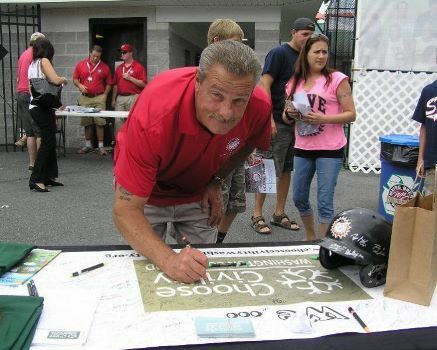 Pictured here is Interim General Manager Bob Bruchey as he signs the Choose Civility banner. 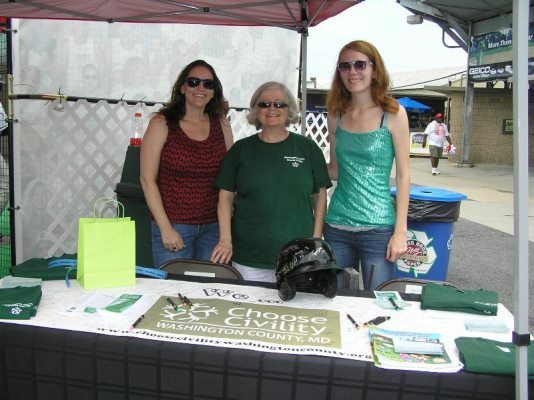 Choose Civility Washington County would like to thank Trisha Bair from USMH and Olivia Cunningham from HCC for their assistance at the Choose Civility Washington County Table at the Hagerstown Suns Baseball Red Out Sunday on June 30, 2013. We also wish to thank the Suns for donating a 2013 team autographed batting helmet as the free raffle prize given away at that event. 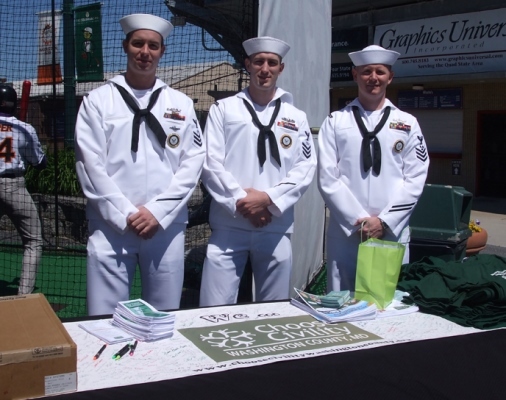 Choose Civility Washington County would like to thank Navy Recruiters ETI James Kearley (Hagerstown NRS Office), FCI Kyle Handy (Frederick NRS Office) and MMI Kenneth Noel (Westminister NRS Office) for their assistance at the Choose Civility Table at the Hagerstown Suns Baseball Red Out Sunday on May 26, 2013. We also wish to thank the Suns for donating a team autographed bat as the free raffle prize given away at that event.